The primary objective of SONARC is to develop a sea ice monitoring and forecasting system based on satellite data and ice-ocean models to support safe operations and navigation in Arctic Seas. Establish a data acquisition, archiving and retrieval system that is updated daily with new satellite data and model forecasts. 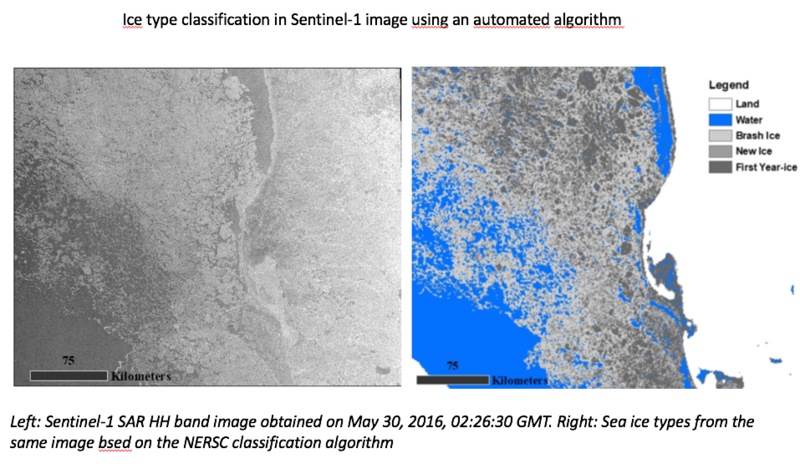 Develop and validate algorithms for retrieval of sea ice classes, motion and icebergs from SAR and optical satellite images. Explore and characterise sea ice processes that are important for navigation and operations, by integrating data from satellites, including AIS data, forcing data from atmosphere and ocean and modelling results. Integrate satellite data and numerical models products to be used in the monitoring and forecasting system. Demonstrate the sea ice monitoring and forecasting system to users operating in Arctic waters. The main objective of SONARC is to develop a sea ice monitoring and forecasting system to support safe operations and navigation in Arctic Seas. SONARC has exploited Synthetic Aperture Radar (SAR) data from satellites as a major component of this system. From 2015 Sentinel-1 has been the main provider of SAR data, deliverig data every day in near realtime for monitoring of sea ice and other environmental parameters. The SAR data are open and freely available from the ESA data hub as well as the national Sentinel ground segment operated by Norwegian Meteorological Institute. A system for data integration and processing, the “Geo-Scientific Platform as a Services” (GeoSPaas) is developed at the NERSC with support from several projects including SONARC. The system provides a chain of processing from importing the data, preprocessing, applying the drift algorithms and making the products from the SAR data. The system has been tested and demonstrated both internally and nationally for the Norwegian Meteorological Institute. 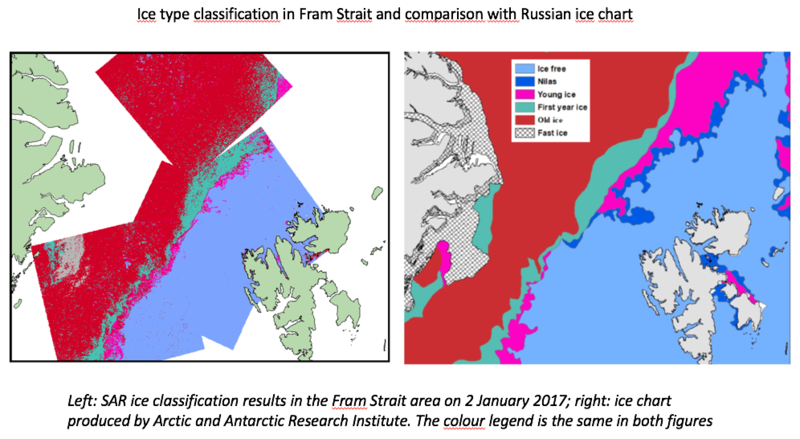 The SAR data used in the project cover ice areas, mainly in the Fram Strait and the Chucki Sea as part of a demonstration of ice navigation. The main activity in the project has been to develop algorithms for processing and classification of icetypes in SAR data. 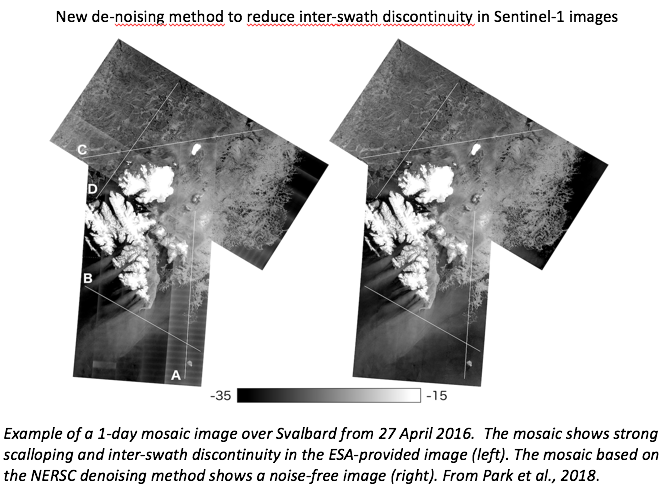 The most important results has been a method for reduction of noise in the wideswath SAR images, developed by the postdoc scientist. The method is adopted by collaborating partners nationally and internationally because it improves the further analysis of the images, in particular the classification of ice types. Furthermore, algorithms for ice drift iceberg detection have been developed in collaboration with other projects supported by the Research Council of Norway (Ice Motion and CIRFA). The ice classification algorithm can be used to discriminate automatically between ice and open water using dual-polarisation images as well as to classify between thin ice, first-year ice and multiyear ice. This implies that open leads, which are important in ice navigation, can be detected in the SAR images. The algorithm work has been done in close collaboration with scientists and students at the Nansen Center in St. Petersburg. The navigation model developed by Scott Stephenson at University of Connecticut have been implemented at NERSC and can be used to estimate optimal sailing routes through ice for different types of vessels. The model has been adapted to use with SAR-based ice classification maps prepared by the classification algorithm. The model has been tested with ice classification maps from Sentinel1- data in the Kara Sea. A set of AIS data (Automatic Identification System) has been obtained from the Coastal Directorate and has been analysed for ship traffic in the Kara Sea area. The AIS data have been used to relate the speed vessels sailing in ice with ice information obtained from the SAR images. To combine AIS data an SAR data, which both are available in near-real time, will be a useful method for planning navigation routes in ice-covered waters. Use of SAR data with ice classification was demonstrated during a field experiment with the Korean icebreaker ARAON in the Chukci Sea in August 2018. The results of the project have been published in several journals and presented in a number of conferences, workshops, courses including teaching at UNIS. The project has been implemented in close collaboration with the partners in Russia and USA. The results have been exploited in other projects, in particular in the H2020 project SPICES, and demonstrated to users such as the Ice Service at Norwegian Meteorological Institute. Jeong-Won Park, Joong-Sun Won, Anton Korosov, Mohamed Babiker, and Nuno Miranda, "Textural Noise Correction for Sentinel-1 TOPSAR Cross-Polarization Channel Images," in IEEE Transactions on Geoscience and Remote Sensing, accepted 2018. Zakhvatkina, N., Korosov, A., Muckenhuber, S., Sandven, S., and Babiker, M.: Operational algorithm for ice–water classification on dual-polarized RADARSAT-2 images, The Cryosphere, 11, 33-46, doi:10.5194/tc-11-33-2017, 2017.